Welcome to Veliko Tarnovo – the old capital of Bulgaria. The town of Veliko Tarnovo (sometimes transliterated as Veliko Turnovo or Tyrnovo) with its unique fortress Tsarevets – The Fortress Of The Bulgarian Kings And Patriarchs, was the spiritual and cultural centre of Bulgaria during the Second Bulgarian Kingdom. Among the unapproachable rocks and pinnacles, surrounded by the hills Trapezitsa, Sveta gora and Tsarevets, the town of Veliko Tarnovo combines history themselves, present and future together. Strolling along the narrow streets in the ancient town, we can enjoy of the Pictures of Traditional Bulgarian Renovated house in the old capital, strangely perched one over another, the small workshops on the Samovodska charshia, the houses of the Bulgarian national revival on Gurko Street. 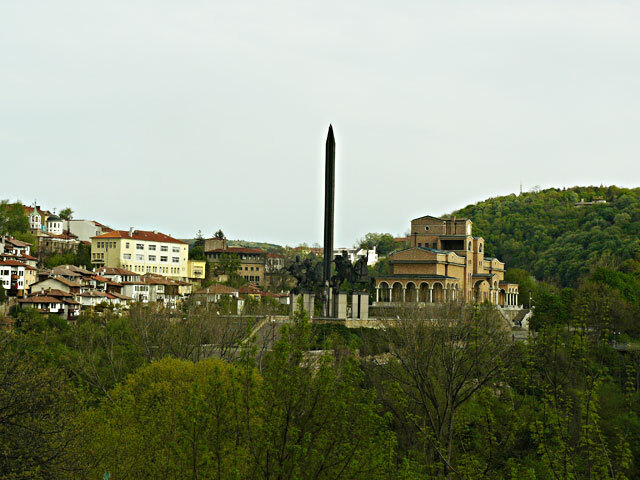 The monuments, a symbol of our violent and heroic past, are scattered all over the town – the monument of the Assens (The Horsemen), raising their swords above all, the monument of Mother Bulgaria, the memorial of the Hung men, also the monuments of Vasil Levski and Velchova zavera, as well as Stefan Stambolov’s Memorial and many others. Here we can bow down to the genius of constructors such as the master Kolyo Ficheto which architectural masterpieces (the House with the monkey, the Khan of Hadji Hikoli and so on) remain as an eternal token of the Bulgarian greatness. Lots of churches and monasteries contribute to the spiritual life in the old capital. 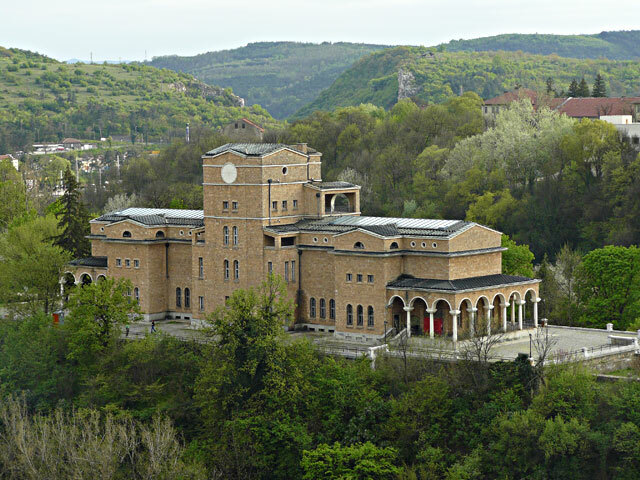 One of the most famous among them is the church of the “Forty Holy Martyrs” where the king Ferdinand declared the Independence of Bulgaria in 1908. There are a big variety of galleries available for the art connoisseurs ( Icons and Wall painting, The National Gallery “Boris Denev”, The Exhibition Halls “R. Mihailov”), as well as the unique art-shops and private galleries. A few museums are open for visiting – the Museum Constituent Assembly, the Prison Museum, The Sarafkina House – all of them as seats of culture and spirituality. Among the huge fund of books in the Regional Public Library “Petko Rachev Slaveikov” one can find curious and little known legends of Veliko Tarnovo. In the Public Record Office you can learn about the great benefactors of the town, as well as some interesting historical facts. To feel the town at shorter range you should visit the numerous shops, supermarkets and trade centres, more important among them are Centrall Mall Veliko Tarnovo, Praktiker, Technopolis, Technomarket, CBA+, Billa, Densi, Iskra Trade Centre, Europe Trade Centre. Also you can watch a mov ie at the Arena cinema, to play bowling or simply to maunder about. Do not miss a walk to the lovely village-reserve of Arbanassi, where unique panoramic views reveal towards Veliko Tarnovo and the mountain Stara planina. If you are keen on tourism you shoud visit all surroundings and admire unbelievable landscapes. After you have sated your cultural and spiritual hunger, done your shopping and gone sightseeing, you can have a bite with relish at some of the restaurants, taverns and pizza places in the town. You can pop in some of the typical beer-houses or night-clubs to take a drink. In the evenings you should visit the discos and clubs and then to spend an unforgettable night at one of the numerous hotels, hostels and guest houses. Find the best hotel in the Map Veliko Tarnovo Hotels. Do not forget about the most important night miracle – the matchless audio and visual performance “Tsarevets – Sound and Light”, a dramatic luminous and acoustic experience of the historical development of Bulgaria. And this is only a fraction of the Veliko Tarnovo magic – come and have a look.